John Souttar was sent off for a second bookable offence. John Souttar saw red as Scotland slumped to a 2-1 defeat by Israel in Uefa Nations League Group C1. It had all been going to plan for Alex McLeish’s side when Charlie Mulgrew blasted home from the penalty spot in the 25th minute after Steven Naismith was pushed by Dor Peretz. But it was the hosts who had looked the better side for much of the first half and they drew level seven minutes into the second period when Peretz prodded the ball past Allan McGregor. 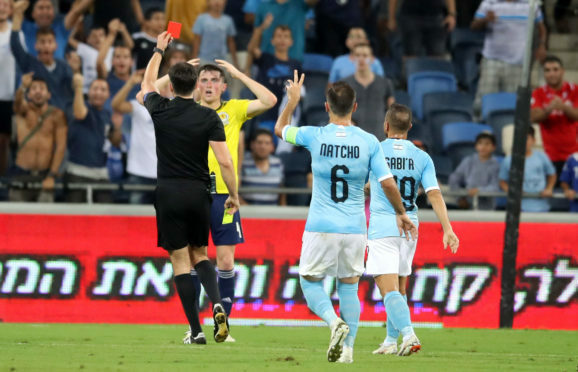 The momentum was with Israel and Scotland’s task became even tougher when Souttar was ordered off for a second bookable offence for a foul on Munas Dabbur. Israel made the numerical advantage count in the 75th minute when former Celtic player Beram Kayal whipped in a dangerous cross that was sliced into his own net. McLeish named an unchanged Scotland side, as he had hinted at the pre-match press conference, which meant no place for James Forrest who had scored four for Celtic at the weekend. The home side had won only one of their last 10 matches which, in part, saw the stadium well short of its 30,000-plus capacity with over 1,000 Tartan Army in attendance. Scotland enjoyed their fair share of possession but their play was laboured and lacked zest, offering encouragement to the home side who almost took the lead when a Dor Peretz header following another Bibras Natcho corner drew a fine save from Allan McGregor. However, the game turned in the 24th minute when Polish referee Daniel Stefanski judged Peretz to have pushed Steven Naismith inside the box after the Hearts striker latched on to an Andy Robertson pass. Defender Charlie Mulgrew confidently stepped up to hammer the penalty past keeper Ariel Harush and the home players carried on their complaints. Imbued with a sense of injustice, Israel came back strongly and striker Ben Sahar skied a chance over the bar before McGregor had to make a save from a Kayal drive with the Rangers keeper then watching a long-distance effort from Dabbur just clear the crossbar. In the 39th minute Sahar sent an angled-drive against the post after escaping from Robertson and O’Donnell cleared the danger when the ball was returned across goal and the first-half finished with McGregor parrying to safety a powerful volley from Dabbur. Aberdeen defender Scott McKenna replaced Mulgrew for the start of the second-half but McLeish’s side continued to toil. The almost inevitable leveller came when Taleb Twatha picked out Peretz who got the best of Robertson before poking the ball into the far corner of the next from eight yards. Scotland were all over the place and things got worse when Souttar, booked in the first-half for a foul on Dabbur, picked up a second yellow for catching the same player on the face with at the edge of the box. McGregor saved Kaya’s free-kick and minutes later Twatha somehow hit the bar from inside the six-yard box after easily getting on the end of an Eli Dasa cross but there was nothing the Ibrox keeper could do when Tierney sliced a Kayal cross past McGregor. Callum McGregor stung the hands of Harush with a 25-yard drive but seconds later his goalkeeping namesake made yet another save, this time from substitute Dia Seba and the home side comfortably saw the game out.